Researchers have discovered why long-term use of L-DOPA (levodopa), the most effective treatment for Parkinson's disease, commonly leads to a movement problem called dyskinesia, a side effect that can be as debilitating as Parkinson's disease itself. 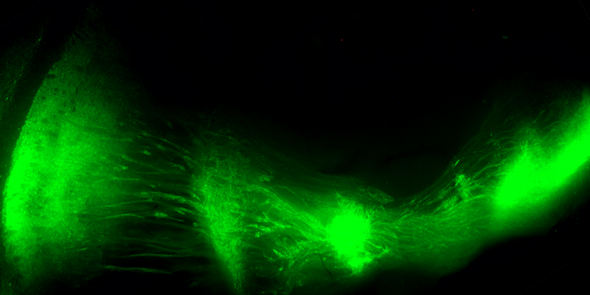 Using a new method for manipulating neurons in a mouse model of Parkinson's, a Columbia University Medical Center (CUMC) research team found that dyskinesia arises when striatonigral neurons become less responsive to GABA, an inhibitory neurotransmitter. This suggests that it may be possible to modulate the activity of these neurons to prevent or delay this disabling side effect. The paper was published recently in the online edition of Neuron. Parkinson's disease, a progressive neurodegenerative disorder, results from the death of cells in various parts of the brain, especially in a region called the substantia nigra. It is in the substantia nigra that dopamine is formed, and when dopamine is lacking neurons fire abnormally, impairing one's ability to control movement. "While Parkinson's is not curable, it is treatable with L-DOPA, which is converted into dopamine in the brain," said study leader David L. Sulzer, PhD, a professor of neurobiology in the Departments of Neurology, Psychiatry, and Pharmacology at CUMC and a research scientist at the New York State Psychiatric Institute. "However, while taking L-DOPA helps patients move normally, in many individuals it eventually triggers uncontrolled excessive movements." Parkinson's is estimated to affect about one million people in the U.S. and up to 10 million worldwide. Most studies into the cause of dyskinesia in Parkinson's have focused on the dopamine receptors that remain in the brain, which over time become over-reactive to L-DOPA therapy. However, the CUMC team decided to look at how neurons of the basal ganglia regulates movement in the absence of dopamine. "Dopamine neurons modulate the basal ganglia," explained lead author Anders Borgkvist, PhD, a postdoctoral fellow in Dr. Sulzer's laboratory. "And because that circuit is still running in patients with Parkinson's, it's long been suspected that other parts of the circuit behave abnormally in this disease." However, scientists lacked a way to stimulate selective parts of the basal ganglia to evaluate what was happening when dopamine is no longer available. The CUMC team employed a novel form of optogenetics and found that after long-term dopamine loss, striatonigral neurons lose their ability to respond to the neurotransmitter GABA (gamma-aminobutyric acid). This effect was not found with short-term dopamine loss. "When striatonigral neurons are working normally, they act as a brake on the basal ganglia, in effect shutting down unwanted movement," said Dr. Sulzer. "But when there is dopamine loss, as in Parkinson's, striatonigral neurons try to compensate, and eventually lose their responsiveness to GABA. Our hypothesis is that when L-DOPA is added into the system, you lose the ability to filter, or turn off, unwanted movement." "Our findings suggest that GABA and GABA receptors are still present in the striatonigral neurons," said Dr. Borgkvist. "So then the question becomes, why they aren't functional? I think that we, or another lab, will eventually find the answer. In any case, the implication is that this defect is correctable, and that would mean that we could prevent or at least delay dyskinesia, so that patients could continue to use L-DOPA." "Patients do not develop dyskinesias in the early stages of Parkinson's, but only after several years of the disease," said Stanley Fahn, MD, the H. Houston Merritt Professor of Neurology and emeritus director of the Parkinson's Disease Foundation Research Center at CUMC. "A major reason why these patients want to delay the initiation of L-DOPA therapy is to avoid these dyskinesias for as long as possible. These new findings open up possible ways to treat or prevent the dyskinesias. If such treatments were found, patients would probably seek to be treated early and improve their quality of life sooner." Dr. Sulzer believes it is likely that scientists will identify other mechanisms, in addition to striatonigral neurons, that contribute to Parkinson's-related dyskinesia.